In 1859, Phillips Brooks, the author of O Little Town of Bethlehem, became a rector at a church in Philadelphia. He stayed in that city for a total of 10 years. The early years of that time were during the Civil War. Brooks was a staunch opponent of slavery and spoke out against it often. People describe him as a man of giant stature—both physically and in the strength of his convictions. Yet he is also described as someone that no one could be completely upset with, either; I guess because of his overall humble spirit. Can you imagine living in a place consumed with war and hatred and racism and slavery, and then riding through the same fields where the shepherds who first learned about Jesus were? A person who had taken a stand against the evil of his day and had lived close to some of the bloodiest battlefields of the war looked out over the city where our Savior was born. Sometimes, the peace that Jesus brings is not an end to the conflict we are facing. Sometimes, the peace that Jesus brings is that He is present with us in the conflict. Mary was engaged to marry Joseph, son of David. They hadn’t married. And yet, some time well before their wedding date, Mary learned that she was pregnant by the Holy Spirit. 19 Joseph, because he was kind and upstanding and honorable, wanted to spare Mary shame. He did not wish to cause her more embarrassment than necessary. 20 Now when Joseph had decided to act on his instincts, a messenger of the Lord came to him in a dream. Messenger of the Lord: Joseph, son of David, do not be afraid to wed Maryand bring her into your home and family as your wife. She did not sneak off and sleep with someone else—rather, she conceived the baby she now carries through the miraculous wonderworking of the Holy Spirit. 21 She will have a son, and you will name Him Jesus, which means “the Lord saves,” because this Jesus is the person who will save all of His people from sin. 24 Joseph woke up from his dream and did exactly what the messenger had told him to do: he married Mary and brought her into his home as his wife25 (though he did not consummate their marriage until after her son was born).And when the baby was born, Joseph named Him Jesus, Savior. and His name will be Immanuel. Can you imagine what Joseph must have been thinking? His fiancé, supposed to be a virgin, comes to him and says she is pregnant. Because Joseph was a good man, he was going to deal with it quietly. He wasn’t going to publicly disgrace Mary. He wasn’t going to stone her to death. But he was going to end their relationship. Until the angel comes to him. And the angel says this is part of God’s plan. And Joseph willingly submits to the will of God. But understand this: the shame, the public perception, the difficulty did not go away. Joseph still had the same situation when he woke up that he had when he went to sleep the night before. But now, there was a peace that he had been missing. I’m not known for having a lot of peace. If the average amount of peace in an eighth grader is 100 grams, I probably have 6. I’m not even joking; I am the most stressed person I know. I gave myself an illness because of this stress. If we’re gonna be honest, let’s just also talk about how the writer of this song was anti-slavery during the flipping Civil War and he seems to understand peace more than I do. I also am a very impatient person. I can wait for something I want for maybe, maybe, thirty seconds. I’m not kidding, I am the second worst wait-er I know (the first is sitting in this room and is related to me, but that’s all I’m giving you). So, of course, Paul over here decided I would be the best one to talk the bulk of the lesson. Now I’m expected to ramble about those things for a half hour. and I stress about myself – the way my stomach sticks out slightly, the way my hair does this weird thing on top, my odd, if not unique, personality, my strange obsession with hugs. Right at this moment I’m shaking in my boots because my peers are here and it’s a lot harder to be real at this time then it was last week. One of my favorite lines is, “But in this world of sin, where meek souls will receive Him still, the dear Christ enters in.” I absolutely adore this line. This verse gives me some of that peace I’ve been missing. I may not be meek, but knowing that close friends of mine can receive Christ makes me feel good. The line encourages me, because in this awful, terrible world, God still comes. He’s going to enter this world, no matter the condition. I recently read a book about aliens who thought of themselves as angels who came to save the earth from itself by bettering the people they came into contact with. They ended up leaving because humans weren’t ready or something crazy. And this was the world God sent his son into. God still saves, even if people are defiant and resolute – God will come. Somehow, we still get to experience the Prince of Peace coming into a world where peace is nonexistent and stress is the king. I am part of a community who believe in a Savior so powerful, I can stand here in front of my peers without having a heart attack. Let’s talk about this waiting thing. Advent is about waiting. Hope for what is to come. Joy for when the waiting is over. Love for…something. Peace for knowing it won’t be forever that we have to wait. Peace for realizing that we have proof that our wait is not everlasting. Oh, yeah – love for having peace! Anyways, like I said earlier, I’m not a good wait-er. I enjoy knowing. I even, don’t hate me for this fellow readers, I read the last page of the book I’m reading so I can know what happens. And if the last page isn’t enough, I’ll keep reading back until I get to a part that will explain what the ending was. I don’t do this whole, “Wait and be surprised thing.” Oh no, I will know the end. Yet I love Advent. I enjoy the whole season, I like the messages, I love, love, love the themes. This begs the question, “Why is Rheannon a walking oxymoron?” Well, that’s because I don’t really have to wait for anything. Of course, I’m waiting for Jesus to return, but I’m not flipping out over it, mostly because I know He will come, which as much of an answer as I need. I already know Jesus has come and will return. I don’t have to wait for that, I have an easy time waiting for this particular thing. I’m sweating just thinking about this. But I do believe in a Prince of Peace, in the Wonderful counselor, but it’s hard. I’m still learning how to find peace in God, still learning to make my own peace. It’s hard for me to imagine that I’m supposed to give everything up, that I can just let the hard things go. Jesus’ early life was filled with anything but peace. A scandalous pregnancy. Being born at the end of a journey miles from home. A king who wanted to kill him. Becoming a refugee to Egypt. Having to pick a home that seemed to be a safe distance away from people who might want to kill him. Our world is not one of peace. There are conflicts. There is confusion. There is angry, fear-based rhetoric. There is the reality of our own lives that we have to face every day. We sing about peace, we long for peace, we love peace, we want peace. But some days, peace is the furthest thing from our grasp. We live in a dark world filled with hate, but we are people who love the light. Peace does not mean all of our troubles will go away. Advent does not mean that all the troubles of the world are resolved. Advent means Jesus comes into this dark world to walk with us. Those of you who are hurting: Jesus is here. Those who are homeless: Jesus is here. Those who have tests tomorrow: Jesus is here. Those who are terrified someone might speak to them: Jesus is here. Those who want to drink or drug: Jesus is here. Those who think this life is meaningless: Jesus is here. Those who hate themselves: Jesus is here. I stand here in front of my peers, panicking in my head, but calm as a cucumber outwardly. I still look forward to learning more Algebra next semester. I’m still excited for school to start in the morning. I will still live my life normally, no matter what the Sun decides to do. I’ll still go home with my parents and brothers and listen to them and roll my eyes at them and love them. I can talk to my friends because I know at least seven of them have been going “same” after all my stress talk, I can still talk to my Freedom peoples because they’re the greatest and the bestest. I can still talk to my dad because he’s the bomb-diggity and will encourage me. I can still talk to people who came to listen to me because after all my talk about being stressed they probably won’t be mean. I can do all this, because God is the Prince of Peace, come to defeat the King of Stress. A friend of mine received some pretty bad news this week. Three days before Christmas, this friend heard the word all of us hate: cancer. Stage 4. It has spread. Another friend of mine is celebrating Christmas without his father for the first time this year. While still opening presents and doing all of the fun things, he is preparing for the funeral that is coming up in a few days. My family is getting together for Christmas tomorrow. Grandparents, kids, grandkids, and great-grandkids will be present. Gifts, food, and joyful noise will ensue. My brother, a funeral director, will be arriving late tonight; he is serving a family by being with them today at the funeral for their loved one. There is this story in the birth narrative of Matthew that does not often get read at Christmas pageants. After a few months had passed, Herod realized he’d been tricked. The wise men were not coming back. Herod, of course, was furious. He simply ordered that all boys who lived in or near Bethlehem and were two years of age and younger be killed. He knew the baby King was this age because of what the wise men told him. weeping and wailing and mourning out loud all day and night. We know it happened. It’s part of the story. We even acknowledge the fact that Jesus and his family were refugees to Egypt, but we do so without talking about the loss of children’s lives. Because Christmas is supposed to be about life and joy and peace and triumph and hope and love. But death is just as much a part of the story as life. Strength is made perfect in weakness. Hope arises out of suffering. We often miss the point of the Christmas story because we focus only on the happy parts. We often fail to fully appreciate the Advent season of waiting because we know how the story ends. No. We remember what the prophet Jeremiah said: she weeps and will not be comforted. The scars don’t go away. But they will be redeemed. Our challenges don’t get resolved like we live in a 30 minute sitcom. Bur they will be overcome. Our grief and sorrow do not vanish. Bu they will be replaced. The death we experience daily does not stop happening. But the life that is to come will bring renewal. 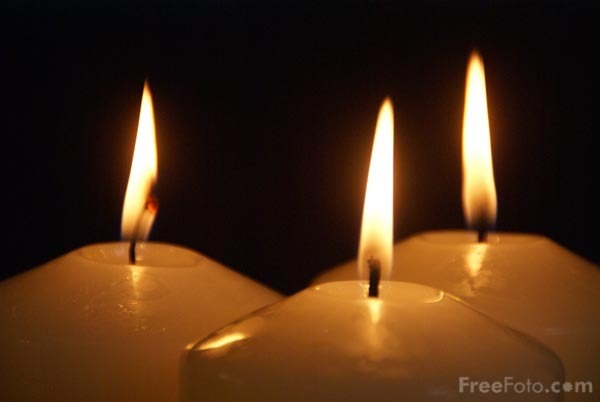 I think those who are hurting right now understand Advent and Christmas in a special, profound, and painful way. Let us mourn with them. Let us weep with those who will not be comforted. Let us remember the pain of death, even as we celebrate the joy of life. Advent is a time of darkness. It is a time of waiting. It is a time of lacking. It is a time of anticipation. The joy at the end of Advent is immeasurable. Jesus comes to bring light into the darkness. Jesus is the fulfillment of all that waiting. He brings what we lack. He is the ultimate end of the anticipation. Darkness is often overwhelming. Waiting is difficult. Lacking leads to impatience and frustration. Anticipation can often lend to helplessness. When I see things in my world that are less than perfect, I often do not know how to respond. And let’s be honest: political rhetoric combined with social media click bait only makes things worse. I want so much to be kind and loving; yet that is often hard to do when I am yelling and screaming at someone hoping to win them over with my volume and superior intellect. And even when I am convinced of my right-ness, I struggle to respond with love. Instead, I become self-righteous and indignant. It is often gratifying to post an angry tweet. But that feeling is short-lived. I kind of hate myself afterward. And a relationship may be strained. And I am back to feeling overwhelmed by the dark. And waiting. And lacking. And anticipating. And then I see a child staring into a candle. 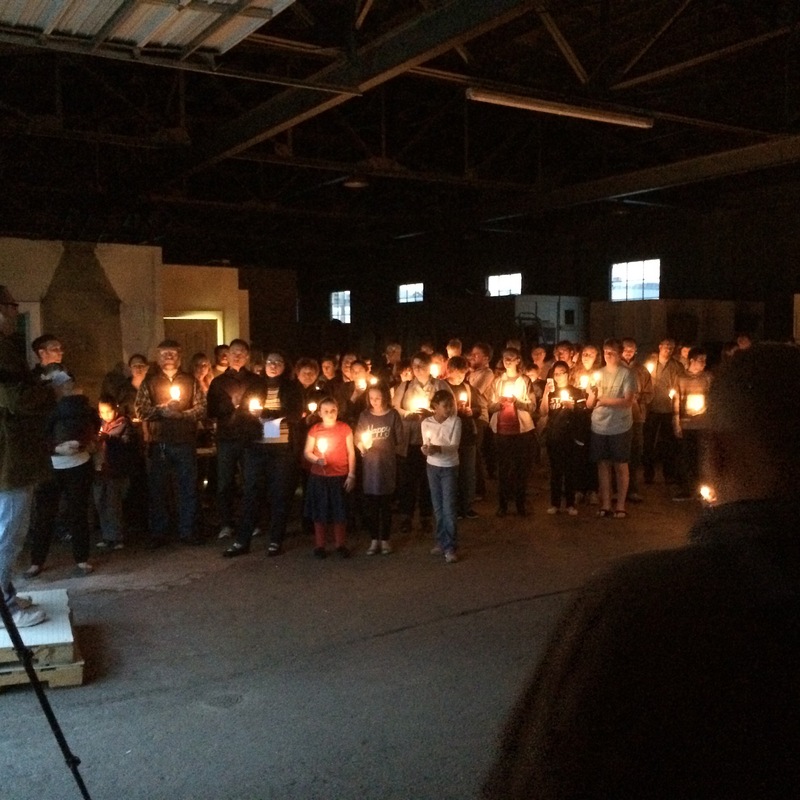 And then I see a group of people standing together, holding candles, and singing together. And then I see conversations taking place between old friends and new. And then I see people learning about opportunities to volunteer. And I hear no angry rhetoric. And I hear no one responding to or acting out of fear. And the darkness does not seem as dark. And the waiting does not seem as bad when there are others waiting with me. And it does not appear that I am lacking as much as I thought I was. And the anticipation does not leave me feeling as helpless. And I learn that I do not need to respond to the fear and the angry rhetoric. I don’t need to win an argument. I don’t need to have the most retweeted angry tweet. All I need to do is love. And listen (a lot). And talk (a little). And look for ways to be kind. May that be my prayer through this Advent season and beyond. What is your Christmas tree blocking from view? What secrets are hidden behind the decorations on your bookshelves? What noise are you drowning out with all the music? I love the way we decorate for Christmas. My wife and I both love nativity scenes (even with all the biblical inaccuracies like wise men at the manger). We love homemade ornaments. We actually have two Christmas trees in our house. One for store bought ornaments and one that holds all the ornaments our kids (ages 16, 14, and 12) have made as well as the ones we have received for nieces, nephews, other family members, and friends. The past couple of years we have started decorating outside the house, as well. I don’t hang lights on the house for two reasons: we rent (which is a GREAT excuse) and I would die trying to do something that involves ladders, tools, and electricity. But we have some lawn decorations and some door and window hangs. We even bought one of those inflatable toy soldiers for the front yard (toy soldiers are second behind nativity scenes in our decorating scheme). I love the fun of Christmas of morning and the unwrapping and the picture taking and the chocolate eating and the movie watching and the game playing and the clothes-trying-on and eating more chocolate. And then going back to bed at about 9:30 AM. I love the family gatherings and the friend gatherings that occur. I have fun at the small gift exchanges we get to go to. I love watching all the school related events that take place: church pageants and choir concerts and band concerts and caroling through neighborhoods. I love the ways we worship during Advent. I love the acknowledgement of waiting and darkness. The reminder that pain exists and this is a dark world. The songs of joy because Jesus came into the world. The confusion, humility, and willingness of a teenage girl. The reminder that evil will not win. I love all of that. It’s great. I wish it lasted all year long. But there is a problem. At least, the potential for a problem. All of that noise, all of those songs, all of those decorations, all of that busy-ness can create an incredible smoke screen. It is so easy to be in the midst of large crowds singing about joy yet still feel isolated and in despair. But as long as we stand under the mistletoe, no one will even notice. As long as we slowly sip our peppermint mocha, we can pretend like everything is okay. As long as we sing Silent Night, no one will make us break the silence that is killing us. What are you hiding from this Christmas? Remember, Jesus came into a dark world in desperate need of redemption. Christmastime, the Advent season, is not (only) about joy and presents and laughter and family. 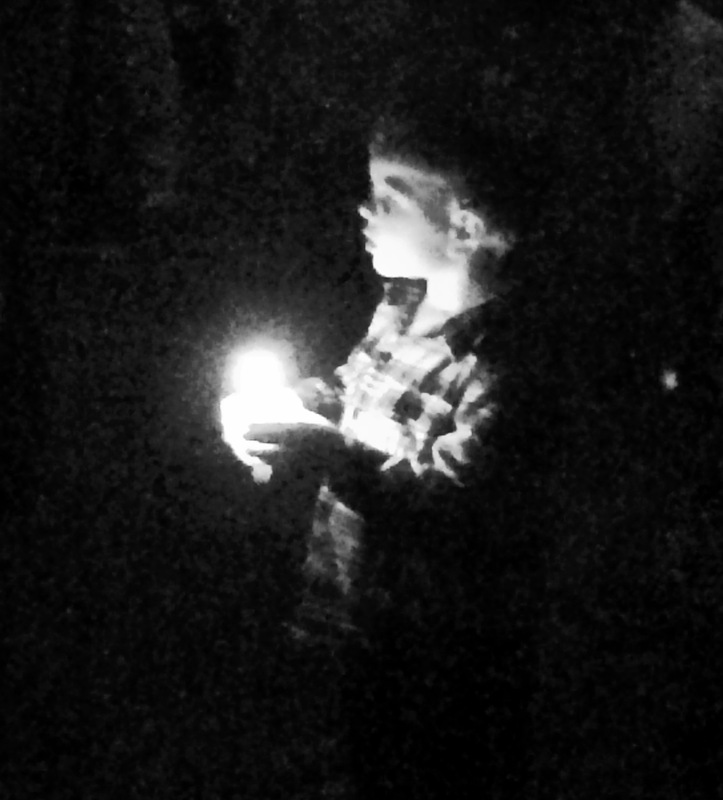 Christmas is about facing the darkness. Christmas is about acknowledging our pain and weakness. The decorations should never hide your pain. The activities should never silence your calls for help. The celebration should be joy at surviving the day. The celebration should be hurting people get to have fun, too. The glitter of Christmas is not found in how much tinsel we wrap around our house. The only things that should be hidden at Christmas are the presents before they are wrapped and put under the tree. Let’s be open and honest with one another during this season. Let’s come together in our shared struggle so that we can share together in our shared joy. I started attending AA meeting in January of 2004. In February, when I picked up my 30 day chip, another person celebrated 16 years. I remember saying at that meeting, “I want to have 16 years sobriety.” And I really did. I didn’t want to be counting days, I wanted to be celebrating years. Only, I didn’t want to actually have to wait 16 years to get 16 years of sobriety. So maybe it’s not a surprise that I relapsed a couple months later. I didn’t want to wait and I lost what I had. When our middle child, our daughter, was born she had some difficulty breathing. They kept her in the nursery to take close care of her, but it was soon determined that she needed to go to another hospital that had a NICU. After five days there, they sent us home telling us we would know in two week what, if anything was wrong. In fact, there were three options: Hirschprung’s disease, Cystic Fibrosis, or nothing. Two weeks. We would have our answer. Two weeks passed. We did not receive a call. I did fine for those two weeks (really!). But the next six days were the longest of my life. My oldest brother was sick. He had been for a while. But we knew that he was deteriorating. Another brother called me and told me to get up to see him soon. He lived in Maryland; I had been living in Texas for less than a year. I asked my brother, and later my father, if we were talking days or weeks. The answer was weeks. I checked my calendar. I picked a date. I called the airline. I booked my flight. My brother, Robert, died a few weeks before my flight was scheduled. It may sound cliché, but I never got to say goodbye. I want what I want and I want it now. I want everyone to agree with each other (but mostly me) without having the difficult conversations necessary. I want health without doctor’s visits and medicines and procedures and recovery. I want 10 years experience when I wake up tomorrow morning. I want Jesus to come back so that I don’t have to put up with all the crap that is out there today. I read the Gospels of Matthew and Luke and I am reminded that when Jesus came the first time, it was not in the time, place, or manner the majority of people were expecting. Why would Jesus’ second coming be any different? I hate waiting, yet Advent reminds me that is exactly what I am supposed to do: wait. There is pain. There is sickness. There is doubt. There is struggle. There is death. I am growing. I am learning. I am surviving. Some days, I am even thriving. I want peace. I want reconciliation. I want restoration. I want Jesus in this world.